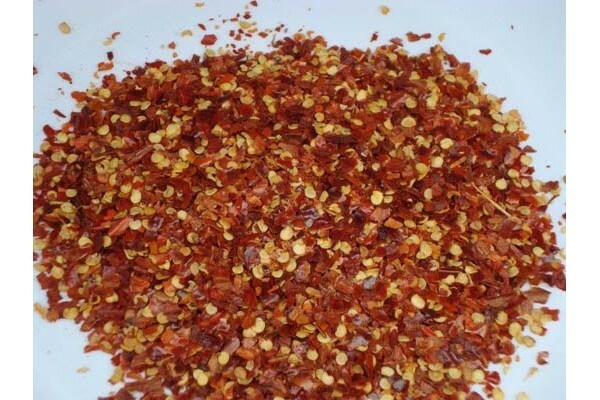 The finest quality Chilli Flakes. Chilli pepper is the fruit of the plants from the genus Capsicum members of the nightshade family Solanaceae. Botanically speaking the fruit of capsicums are berries. Depending on flavor intensity and fleshiness their culinary use varies from use as a vegetable (e.g. bell pepper) to use as a spice (e.g. cayenne pepper). It is the fruit that is harvested. Chilli peppers originated in the Americas; and their cultivars are now grown around the world because they are widely used as food and as medicine. The substances that give Chilli peppers their intensity when ingested or applied topically are capsaicin and several related chemicals collectively called capsaicinoids. Capsaicin is the primary ingredient in pepper spray. When consumed capsaicinoids bind with pain receptors in the mouth and throat that are normally responsible for sensing heat. Once activated by the capsaicinoids these receptors send a message to the brain that the person has consumed something hot. The brain responds to the burning sensation by raising the heart rate increasing perspiration and release of endorphins. The "heat" of Chilli peppers is measured in Scoville heat units (SHU) which is the number of times a Chilli extract must be diluted in water for it to lose its heat. Bell peppers rank at 0 SHU New Mexico green Chillis at about 1 500 SHU jalapeños at 3 000-6 000 SHU and habaneros at 300 000 SHU. The record for the hottest Chilli pepper was assigned by the Guinness Book of Records to the Naga Jolokia measuring over 1 000 000 SHU. The Chilli has a long association with and is extensively used in Mexican and certain South American cuisines and later adapted into the emerging Tex-Mex cuisine. Although unknown in Africa and Asia until its introduction from the New World by the Europeans the Chilli pepper has since become an essential pillar of the cuisines of Ethiopia, India, Indonesia, Korea, Laos, Malaysia, Pakistan, Southwest China (including Sichuan cuisine) Sri Lanka, Thailand and many other cooking traditions. The fruit is eaten raw or cooked for its fiery hot flavour concentrated along the top of the pod. The stem end of the pod has most of the glands that produce the capsaicin. The white flesh surrounding the seeds contains the highest concentration of capsaicin. Removing the inner membranes is thus effective at reducing the heat of a pod. Chilli peppers are used around the world to make a countless variety of sauces known as hot sauce chile sauce or pepper sauce. In Turkey Chillis are known as K?rm?z? Biber (Red Pepper) or Ac? Biber (Hot Pepper) and are used in the form of either red pepper paste which can be hot or mild. Harissa is a hot pepper sauce made of Chilli, garlic and flavoured with spices originating in Tunisia and widely used in its cuisine both as a condiment and as seasoning. Harissa is also found in other North African cuisines though it is often treated as a table condiment to be served on the side. Indian cooking has multiple uses for Chillis from simple snacks like bhaji where the Chillis are dipped in batter and fried to complex curries. Chillis are dried roasted and salted as a side dish for rice varieties such as daddojanam ("dadhi" curd "ojanam" rice in Sanskrit) or Thayir sadam (curd rice) or Daal Rice (rice with lentils). The soaked and dried chillies are a seasoning ingredient in recipes such as kootu. It is called "mirapa" in telugu.